Thai Kitchen ~ Why haven’t I eaten more Thai?! Today was my planned splurging day for 14 days of fantastic Bikini Bootcamp eats. My co-worker had asked me last week to go with her to this new Thai restaraunt that opened by our work and I told her she had to wait until THIS week! 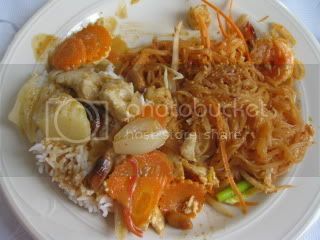 Wow, it was absolutely worth the wait – it left my wondering why have I only eaten Thai food twice in my life?! It’s a super cute little building ~ really, there are like 5 tables inside – so quaint. I LOVE good food for cheap! 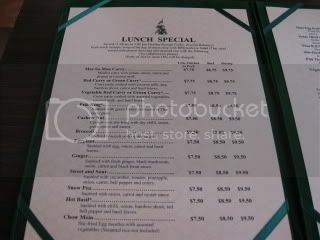 Check out all the amazing lunch specials that they have. My co-worker picked something I am glad I can type because I sure know I couldn’t pronounce it ~ Mas-Sa-Man Curry. I couldn’t resist trying the Pad Thai. 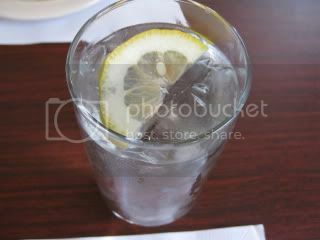 I have a big glass of lemon water to be prepared for the spice that might hit. 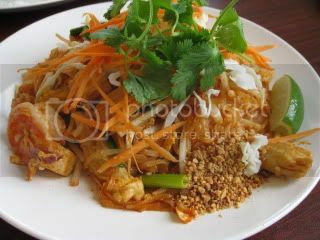 I always rememberd Thai being super spicy, but, you know what….it was a nice spice! Our lunch specials started us off with a choice of soup or salad. 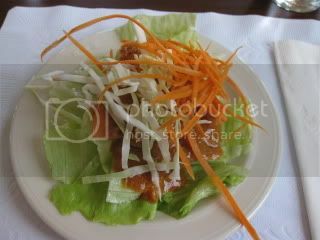 I HAD to pick the salad as soon as I found out it came with a Spicy Peanut Dressing ~ my favorite! Underneath all that was cucumbere, egg, tomato and just tons of crisp salad with a spicy, sweet, peanutty crunch. 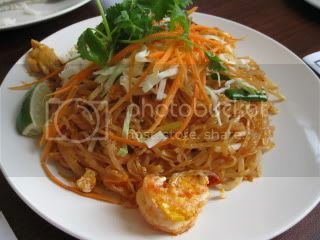 First up was the Pad Thai ~ check out this gigantic portion. Check out how big the shrimp are – Yum! I am so glad my co-worker likes to share so I got to try everything – yeah! 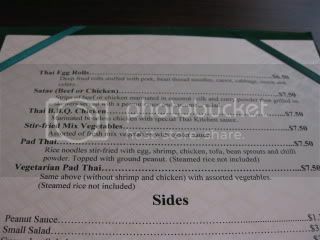 Hers included steamed rice but I was really excited to see that the menu offered brown rice. Yeah for healthy choices! 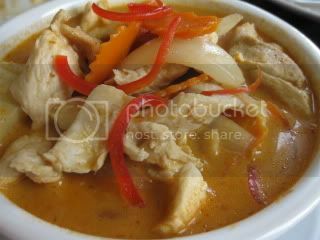 And her dish that I STILL cannot pronouce – Mas-Sa-Man Curry. 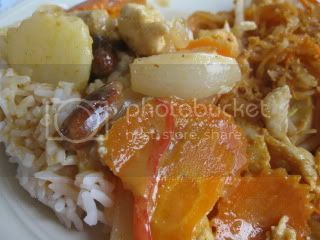 It has potatoes, chicken, carrots, onion and PEANUTS! 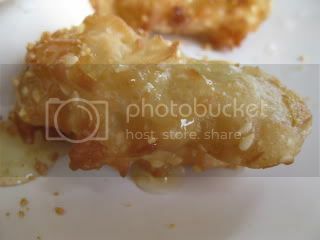 I had two plates that looked like this. 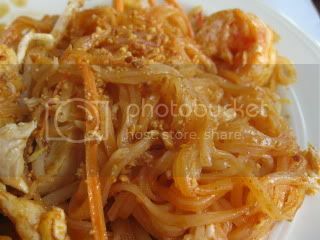 I LOVED the sauce in my co-worker’s dish ~ I was pouring it on over the pad thai. It was coconutty, peanutty and a little spicy ~ so good! We DID manage to leave some for leftovers for her hubby just so that we could have dessert. 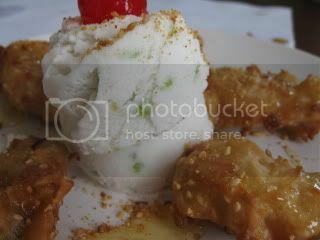 Seriously ~ how can you pass up of a “Fried Banana” with Thai Coconut Ice Cream! 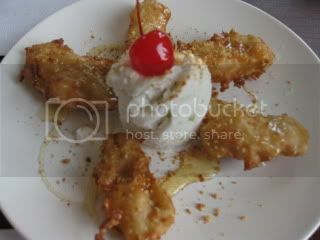 Banana Goodness with sesame seeds and honey drizzled all over! I think at this point I decided that bananas just might be my favorite fruit. 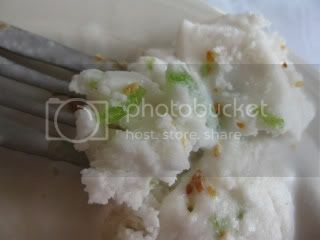 The Thai Coconut Ice Cream was soooo interesting. I am still not sure what the “green” things are that are in it though. Any ideas? They didn’t really taste like anything at all. Sadly we actually left some bananas behind so we wouldn’t be completely stuffed. It was such a fantastic lunch and I had a great time gossiping with my co-worker about her latest trip to Hawaii ~ ahhhhh, we need to go on vacation somewhere soon! I LOVED Thai Kitchen and cannot wait to go back….Anyone want to go?! LOL…..I need someone to share with me so I can try more. There are some Holey Donuts with waiting for you with your name of them ~ THREE boxes as a matter of fact! Click HERE to tell me why you want to have a lowfat donut! I can't believe you've only had Thai food 2– now 3 times! I love Thai. My favorite is Pad See Ew, with chicken (wide rice noodles with veggies)… so good!!! The green things could be lime shavings/peel? I don't know! 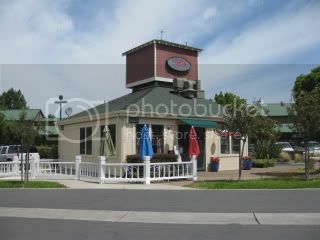 I do know that that restaurant looks awesome! All the Thai restaurants around here are such hole in the walls! the green looks like lime peel that was "shredded" on a microplane. YUM! 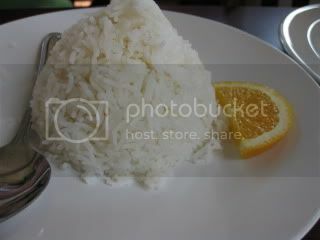 I love thai food and most of the restaurants around my house offer brown rice. I had the BEST thai dish last night, basil chicken and veggies. It had TONS of good veggies (sugar snap peas, mushrooms, red pepper, baby corns, etc). I wanted to lick the plate, but resisted! Angelea ~ It was SO good! 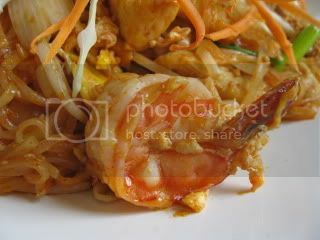 Anne ~ The Pad Thai was pretty tasty, but, I almost think I liked my co-workers dish better surprisingly. Felish ~ Me either! I definitely need to try the dish you recommended next time for sure. K ~ Ya I was wondering if it was lime or parts of the outter coconut? Do people even eat the green part LOL…it was good either way though! Janetha ~ I so need to get caught up on your blog. I saw that you went to a Thai class and haven't had any time to read – must do that ASAP! 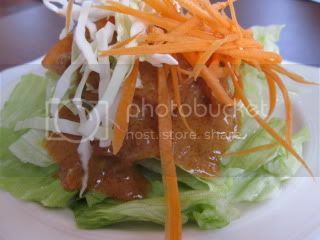 Sachiko ~ Ohh – your Thai dish sounds good too. I should see if they have something similar next time I go. Whether she’s enjoying a dish at a local restaurant or whipping up a crowd-pleasing, nutritious meal at home, Danica has a passion for all things food. She believes in and follows the Weight Watchers principle of “all things in moderation” and chronicles her culinary adventures here. Besides sharing her daily eats and tasty, nutritious recipes, Danica connects others seeking a healthier lifestyle on her site and shares her travel adventures with her husband around the world.